The Arco 35 was announced in late 1952 and delivered in early 1953. A special accessory called the View-Arco was released in 1954, which transforms the camera into a 35mm TLR: the device comprises a viewing lens and waist-level reflex viewfinder. The focusing screen and viewing hood mount in the camera's accessory shoe, and the lens is screwed to the lens standard, so that the finder follows the camera focus. The range was extended in 1955 and 1956 with the appearance of the cheaper Arco 35 Junior, with a four-element f/3.5 lens, and of the more advanced Arco 35 Automat, with lever advance and bright-frame finder and a choice of five-element an f/3.5 or f/2.8 lens. 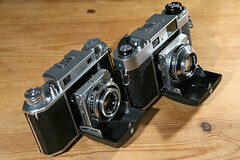 The two Automat models were superseded in mid 1956 by the Arco 35 Automat D, with a five-element Arco f/2.4 lens. This lens would be offered as a standard lens for some Miranda SLR models too. ↑ Hagiya, p.53 of Sengo kokusan kamera jū monogatari. ↑ Hagiya, pp.54–5 of Sengo kokusan kamera jū monogatari. ↑ All of these are pictured in Hagiya, pp.55 and 58 of Sengo kokusan kamera jū monogatari. There is also a list of product codes for all the Arco products on pp.56–7 of the same. ↑ Source: advertisement dated July 1950 reproduced in Hagiya, p.55 of Sengo kokusan kamera jū monogatari. ↑ Advertisements reproduced in Kokusan kamera no rekishi, pp.116 and 221. ↑ All the details of the 6×6 SLR project: Hagiya, p.59 of Sengo kokusan kamera jū monogatari. ↑ 7.0 7.1 Hagiya, p.59 of Sengo kokusan kamera jū monogatari. ↑ Arco 35 serial no. 130138, with View-Arco reflex finder accessory, sold in the 20th Westlicht Photographica Auction, on 1 November 2011; the camera has the f/2.8 Colinar lens, and the finder an f/2.8 View-Colinar. ↑ Hagiya, pp.69–70 of Sengo kokusan kamera jū monogatari. ↑ Date: Hagiya, p.70 of Sengo kokusan kamera jū monogatari. ↑ The last advertisements for the Arco 35 Automat D listed in Kokusan kamera no rekishi, p.378, are dated October 1957. ↑ Hagiya, p.76 of Sengo kokusan kamera jū monogatari. Two different bankruptcy dates are given in Lewis: December 1959 on p.104 and January 1961 on p.97. ↑ All product codes: Hagiya, pp.56–7 of Sengo kokusan kamera jū monogatari. Lewis, Gordon, ed. The History of the Japanese Camera. Rochester, N.Y.: George Eastman House, International Museum of Photography & Film, 1991. ISBN 0-935398-17-1 (paper), 0-935398-16-3 (hard). Pp.97 and 104.